Week 17 of the NFL coming up in 2.5 Hours!!! Do you know what to consider handicapping Week 17??? Fortunately, some of my subscribers keep me in line when I make a mistake. The bowl games are not until tomorrow so disregard my posts as the numbers will most likely bounce around. Occasionally I get so consumed with my handicapping I overlook the obvious:) Like what day of the week it might or what year it is! Betting is 53% on the dog (a familiar pattern it seems) with the line moving from -2.5 to -3. Models strongly favor Iowa. Variables slightly favor Iowa and Public betting favors Florida. We have seen this in almost every game where what I look at shows conflicting information. So I will be doing exactly what I did on these setups…Passing. I see no edge on the game. Betting is 58% on Wisconsin the favorite with the line moving from -7.5-102 to -8.5 -102. Models strongly favor W. Mich, Variables are neutral, Public betting is Neutral. All you have here is models however there is nothing pointing to conflict with them. Myself I need at least 2 things to match up with the 3rd neutral or better. This is far from that. 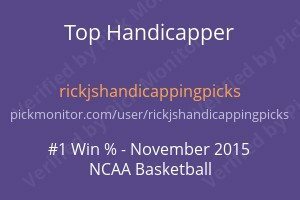 But if you have other successful handicapping techniques that point to Iowa you might consider my models in the mix to help you decide. Myself I am passing on the game. Saturday things slowed down a bit despite the heavy schedule of games. We had 4 plays and went 1-2-1. Today no plays have been sent out and we have the final week in the regular season NFL on tap today. Before I get into the numbers today in the NFL let me start by saying week 17 is a bear to handicap. There are so many cross currents to consider that change depending on the scores of the other games during the day that I feel it’s best not to bet the final week. Saying that if anything really stands out I will bet it. So keep a watch for my posts regarding the NFL. I am having my worst year ever in the Hilton Contest with a 36-41-3 record. Plays have not been a ball of fire this season in the NFL either with a record of 13-12 on 1 unit side plays. I am going to take a look at the NFL during the offseason and see what didn’t work and figure out why. 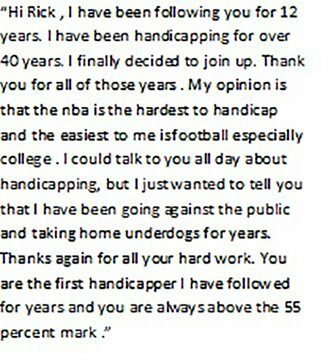 As I have said many times handicapping is not static. All parts are moving parts which make handicapping sports fascinating. But as one sport struggles you have others to take its place. MLB, NCAA BB, NCAA FB, have been solid and have picked up the slack easily. The Top 5 got off to a dismal start but now has worked itself back to 36-40-4 with a 4-1 record last week. Like I said before be careful in week 17 unless you are adept at making wagers in the NFL this week. What works in the regular season does not work in week 17 at all. If you did not know that and why then hold off betting the NFL today. I will post a few of the bowl games today so keep a watch for those.